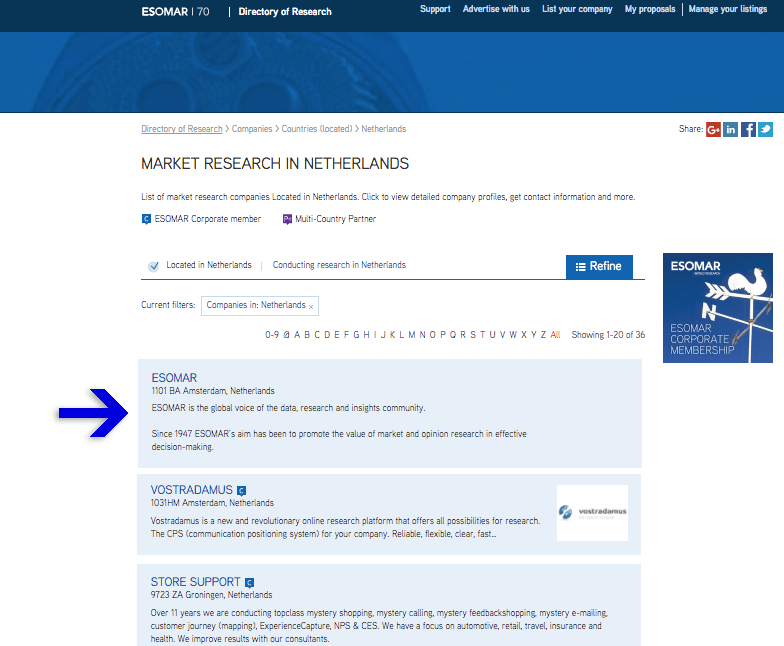 Apply NOW to ensure you, your company or your services are listed amongst the 1,600 major data, research, analytics or insights organisation and individuals already listed worldwide in the ESOMAR Directory. 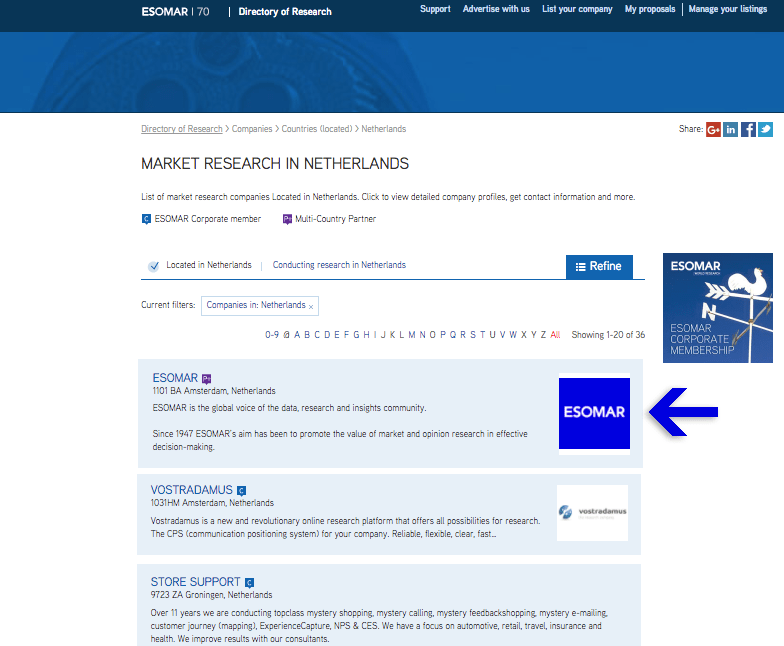 ESOMAR Corporate Membership offers a wide array of benefits, one of the many being a listing in ESOMAR Directory - a go-to catalogue of reliable market research providers around the world. We look at ESOMAR as a major source of knowledge and insights. The access we have gained to the archive of hundreds of research papers; in addition to the network of public opinion and research insiders and professionals has added great value to our multilayered mission and is considered as an opportunity of real growth. We feel proud to be part of ESOMAR’s large community as it reflects our professionalism and commitment to ethical practice and international guidelines. 70 years of experience plays a major role in providing us with a better understanding of the global research industry and makes a significant difference to our core activities. ESOMAR is a safe and trustful bridge which connect clients to data, insights and market research professionals, to achieve reliable results. 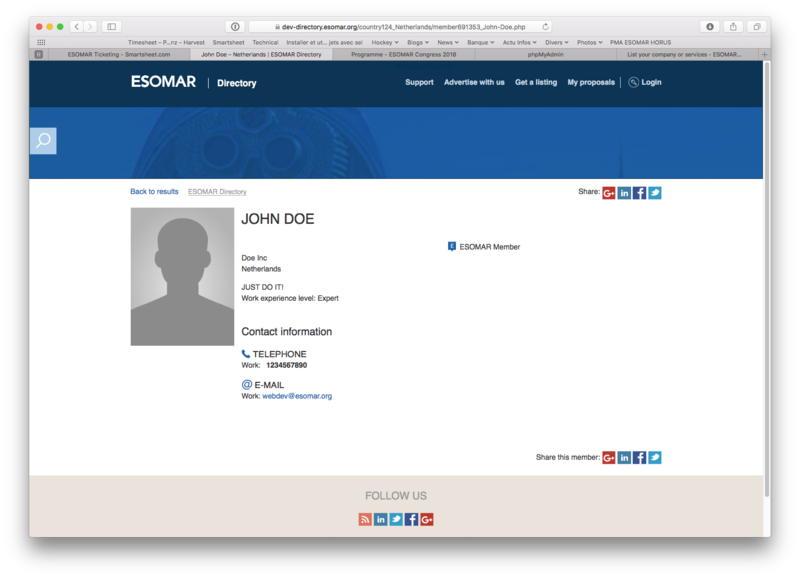 It is my pleasure to be a member of the ESOMAR family. Membership in this worldwide community gives an access to all experience, knowledge and networking contacts of the industry. And our company has become recognizable by other research players. 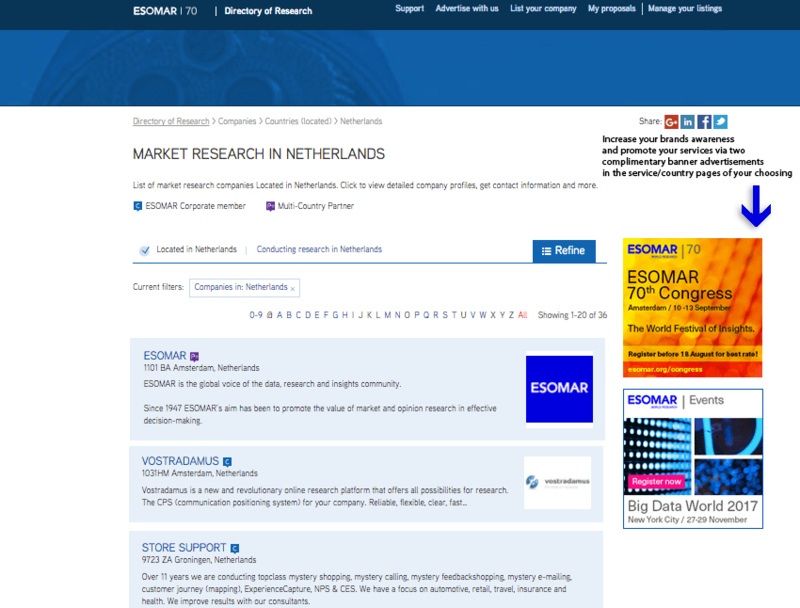 The ESOMAR Directory is the industry’s first and largest resource of international market research, data, and insights companies and professionals, attracting international marketers, market research professionals and research clients that are actively seeking assistance on research projects or agencies looking to build partnerships. Since 1957, our directory remains the premier reference point for businesses to find the ideal trusted partner. 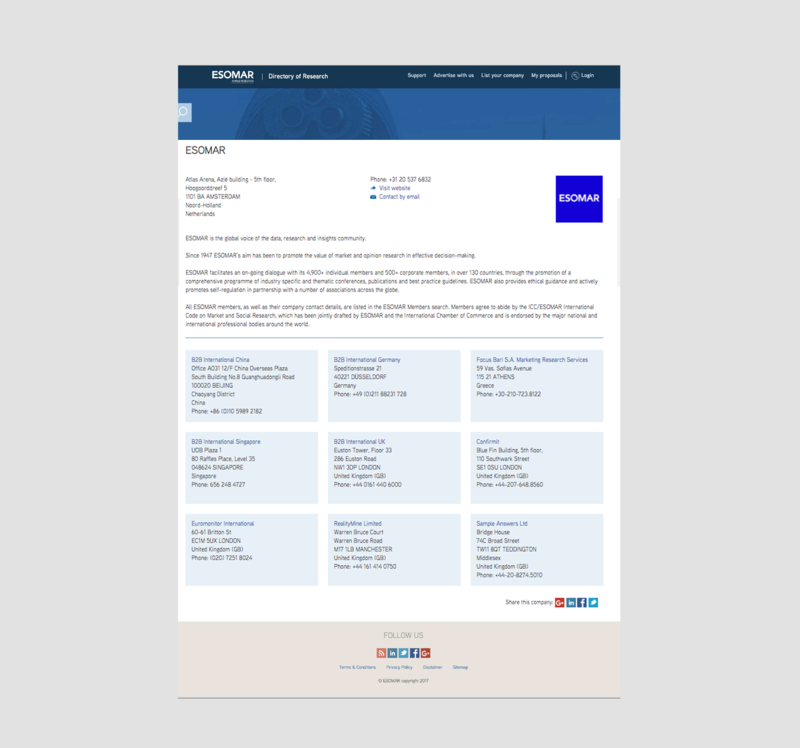 All organisations and individuals included in the Directory are ESOMAR Members or employ at least one ESOMAR Member in their office, giving research buyers the reassurance that all companies listed conform to the highest professional standards and have undersigned to abide by the ICC/ESOMAR International Code on Market and Social Research. With more than 35,000 visitors a month, the ESOMAR Directory has proven to be an invaluable business investment for ESOMAR members. 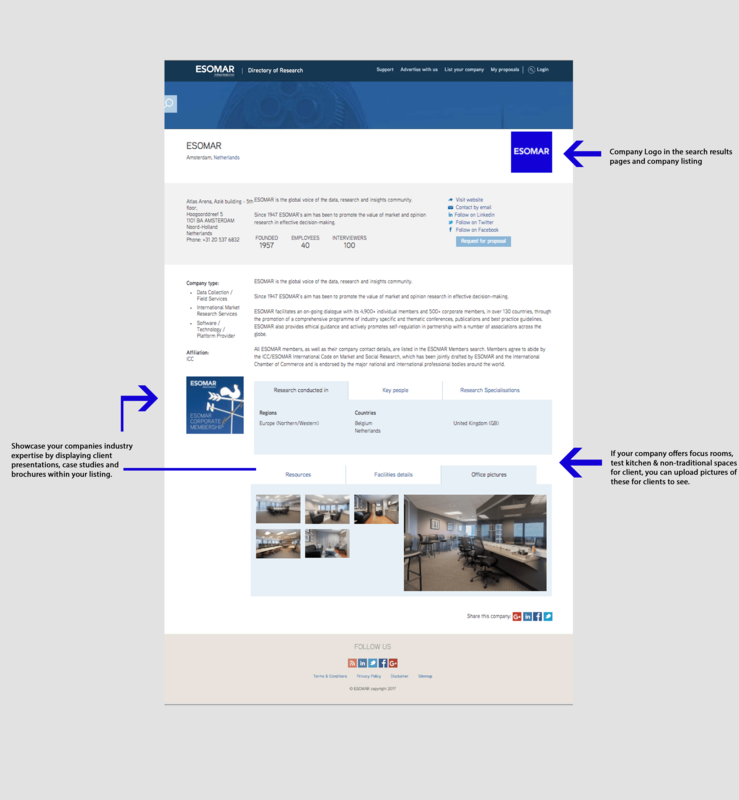 New features include tender request functionalities, mobile optimisation and facility pictures. 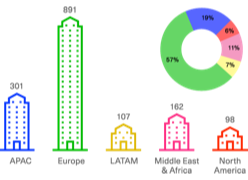 Over 100 Requests for Proposal (RFP) are submitted every month by research buyers to listed companies. If you or your company are not listed you will be missing out on receiving business enquiries that your competitors get. 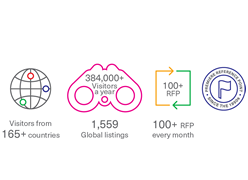 With different listing types to suit any budget, the ESOMAR Directory offers cost-effective means to reach large audiences of international data, research and insights users and buyers you will not find anywhere else. 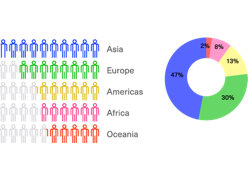 Sellers of research products and service providers that promote their companies through the directory, ultimately strengthen their brand, generate more qualified leads and grow revenues. ESOMAR Corporate Membership includes a standard listing for your company headquarters and also offers a reduced rate for additional branch office listings. For more information on how to become a Corporate Member, please visit www.esomar.org/membership. ESOMAR Corporate Membership includes a premium listing for your company headquarters and also offers a reduced rate for additional branch office listings. For more information on how to become a Corporate Member, please visit www.esomar.org/membership.